This Valentine’s Day, my hubby surprised me by cooking a delicious new recipe for salmon, and although an inspired recipe, I just had to share the dish. The flavor and texture of the fish was amazing and pan roasted salmon has quickly become one of our favorite methods to prepare salmon. The side dishes were a caramelized onion and Brussels sprouts, and brown rice quinoa with minced garlic. Combine whiskey, pineapple juice, vinegar, shallots, paprika, garlic and chipotles for the beurre blanc in a small saucepan over medium-high heat. Bring to a boil, and reduce until liquid is nearly evaporated. Stir in honey, tomato paste and Worcestershire sauce. Turn off heat, whisk in butter a few cubes at a time until incorporated; season with salt and pepper. transfer to a glass dish and set inside a bowl of hot water to keep warm while roasting the salmon. 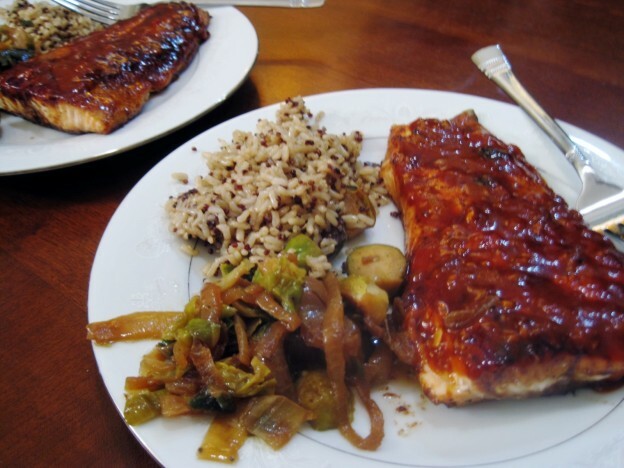 Combine brown sugar, salt and spices for the salmon in a small bowl, rub on the top side of the salmon fillets. Sear the salmon fillets, rub-side down, in oil rubbed prepared large ovenproof skillet over high heat. When the fish releases easily and rub side is browned, about 2 minutes, flip fillets and transfer pan to oven.